We are still adding classes to the calendar. 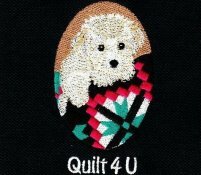 Check it out and sign up at www.quilt4u.com. 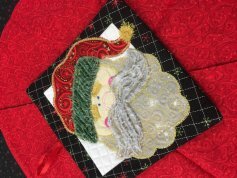 This was today's class - if you were unable to attend but would love to learn how to make this on your embroidery machine, e-mail me at info@quilt4u.com and let us know if a week day or evening class would work better for you. The ladies had a good time and learned lots. Not sure if they will use their hot pad - who would want spaghetti sauce on such a cute potholder? Kitchen decor? Yes! We still have lots of Anita Goodesigns on sale for our Red, White, Boom Sale! Prices $10.00, $15.00, $25.00. This is a great opportunity to purchase some designs at a really good price.